Like the title says, I am having problems figuring out how to add, update and delete values directly to my SQL database table. 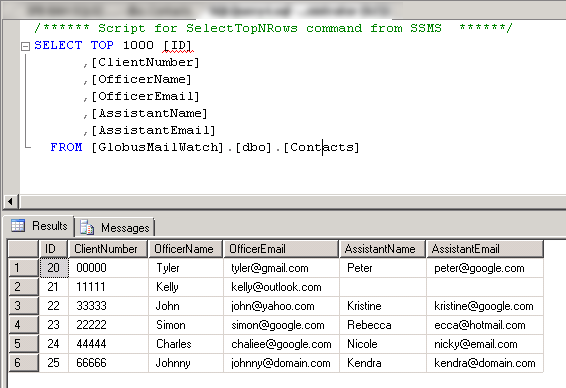 Below is my application as well as the table in the SQL Database. This was initially working with the below code.
" 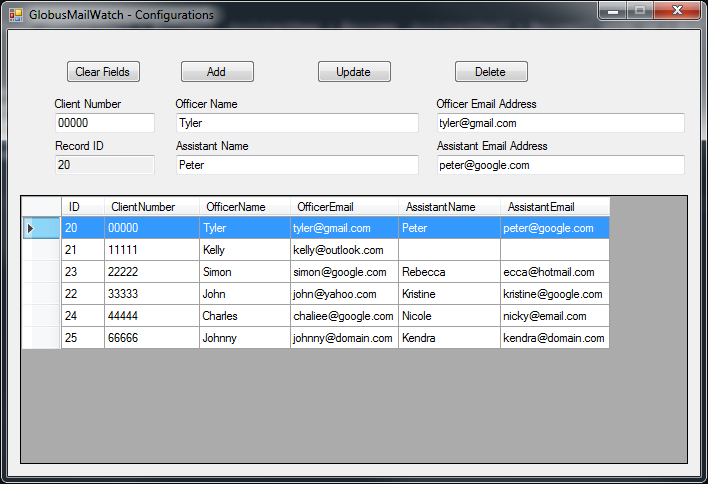 VALUES ('" & txtClientNum.Text & "', '" & txtOfficerName.Text & "', '" & txtOfficerEmail.Text & "', '" & txtAssitName.Text & "', '" & txtAssitEmail.Text & "')"
'Repopulate datagridview with updated changes. However I read somewhere that it was best practice to use parameters, so I added an "ID" column in my table made it the primary key and set it to auto-increment and had a go with the below code, but its not working. No errors, just doesn't add the new information to the SQL table. With the updating I again tried the using parameters a little differently but have been unsuccessful. No errors, just does not update the SQL table. sSQL = "UPDATE Contacts SET ClientNumber = @cnum ,OfficerName = @offname ,OfficerEmail = @offemail ,AssistantName = @assname ,AssistantEmail = @assemail WHERE id = @id"
This I attempted a new approach but again is not working. No errors, just doesn't delete the selected record from the SQL table. sql = "DELETE FROM Contacts"
" AND AssistantEmail = '" & txtAssitName.Text & "'"
There is code for everything except, executing the command. Why not google and find a complete working example. Thank you and apologies for not responding sooner.